I ended this weekend practically on my knees. Following a busy social week, I had to contend with my youngest's carnival and his 5th birthday party, given at home. 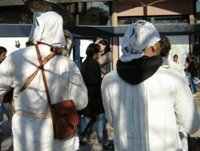 On Friday afternoon, about an hour before we were due to go out for the evening, his teacher tells me that the mamans could come to the carnival in costume too. My brain did a quick mental check of vaguely suitable options from the garage to the cupboards and decided then and there that no way was I going to spend the night concocting something wacky out of egg boxes and washing up bottles just so I could fully participate in the carnival. I'd just have to be a party pooper. My youngest goes to a Maternelle run by men. Of the 5 teachers, 4 are guys. They are a jolly bunch despite a tendency to go on strike, and once a year, the director indulges his fetish of dressing up as a pantomine dame. I'm not sure he realises that this is what he looks like, but as he is big and burly, wears outlandish costumes and hams it up totally, this is indeed what he resembles. I should tell him one day. 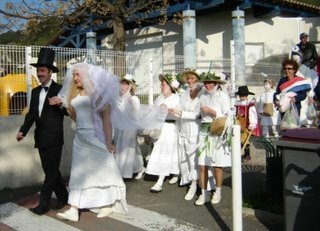 This year, the theme was a wedding party. My son's teacher was the groom to the director's bride. The female class helpers were harmoniously dressed in flowery bonnets as the bridesmaids. There was even a faux Mayor in her sash. The kids had no restrictions and were told to come as they wished. My youngest wore his brother's Spiderman outfit which was way too big, but there was no stopping him. Had I been an assiduous mummy, I may have been able to rustle up a little something so amazing people would have pointed in wonder. As it was, I didn't, and neither did anyone else either. No competitive mummying going on here, thankfully. 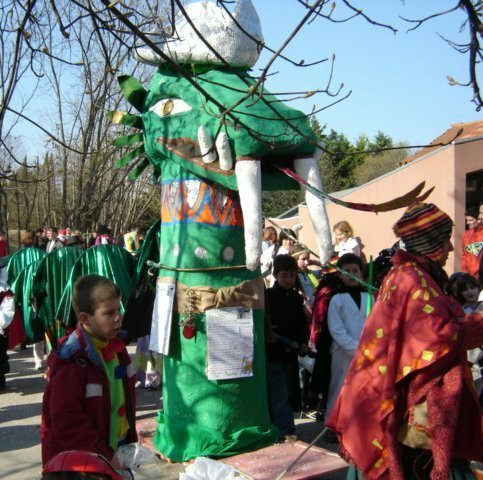 We joined the junior school with their papier mache dragon and set off, with a jazz band to amble along the streets of the village. 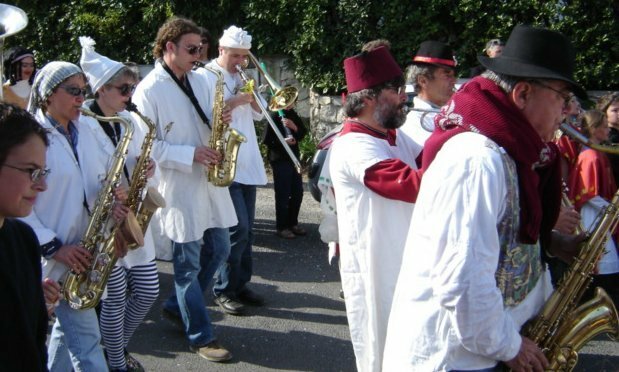 The band was not your average um pah pah splat splat group of 'traditional' carnival 'musicians' dragged out of mothballs and revived for the annual merriment. No, this was a band fit for a wedding party, complete with underpants headgear and sheet music on sticks. Parents were obliged to participate to keep their kids in check, take photos, videos and swell the cortege to respectable numbers. Enough to piss off any passing motorists caught in the backlog of traffic waiting to pass as we unhurriedly dawdled across the road. Up the hill and under the arch into the medieval part of the village with the road no more than a couple of metres wide, we came to the castle and then to the church. At the church, the 'bride and groom' stood on the steps for photos while the band struck up suitably celebratory music. The groom presented the bride with a ring and he got a 'kiss' for his trouble. It was all hysterical. The atmosphere was truly one of carnival, with the organisers behaving the silliest and thus setting the tone of the whole event. 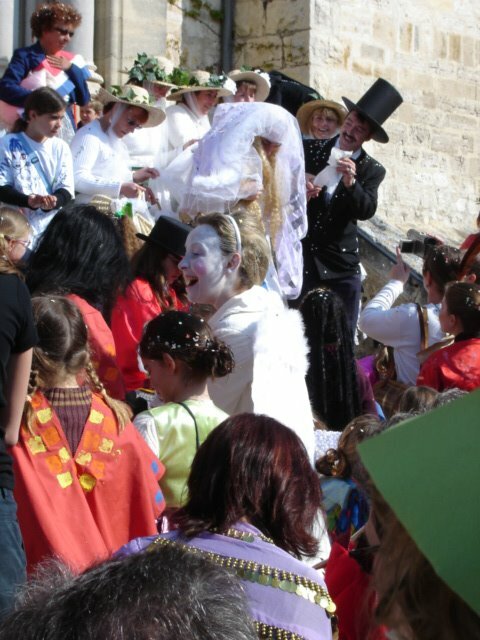 The kids, of course, loved it and the elder ones rampaged around with their Starwars costumes holding intergalactic battles on the ramparts and stone ballustrade outside the church. Everyone threw confetti over everyone else, except my youngest who wanted to keep his, and in fact, collect as much as possible along the way to fill up his confetti pot. We must have been the only ones who went home with more confetti than we started with, and this from a boy! After a leisurely pause at the church, we made our way back down the hill to the schools where an aperitif had been laid on, in typical French village style. 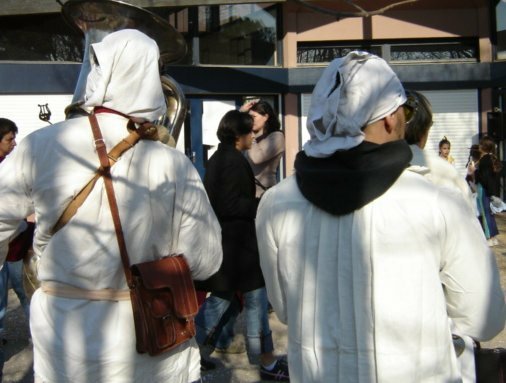 Having had a late night the night before, however, I was feeling buggered and had no desire standing around even more, after standing all morning so far, talking to nice enough people, but no one I desperately wanted to say anything to that I hadn't already said during the carnival. My youngest was also passing out from want of food, he said, and so we abandoned ship and went home to coffee and biscuits.